1. Italeri's new 1:48 AB205 / UH-1D #2621 is based on the same mould as their 1998 UH-1D 'Slick' #849, and appears NOT to be a re-issue of the old Esci moulds, despite what has been written here and elsewhere. 2. As indicated earlier, Revell's re-issued 1:48 CH-53GS/G #4446 includes extra parts for the GS version such as new rotor blades (also suitable for Pave Lows) , protective covers for the seats, sensor and camera parts for the fuselage, pylons and new auxiliary tanks, antennae under the fuselage, optional sand filters (Pave Low again), etc. It isn't very obvious how you decide on which of the HEER / KFOR / IFOR / ISAF titles are correct for each specific aircraft, nor are some of the parts options very clearly defined, so reliable references will be essential if strict accuracy is needed. The box carries photos of 85+09, 84+06, and 85+12, which isn't very helpful since none of these are among the decal options supplied. The F-40 book on the CH-53G published in 2001 (includes some GS) is very good, and includes clear detailed drawings of the camoflage of 85+03 that don't entirely agree with those in the kit instructions - I'd go with the book! Nevertheless, this is an impressive looking kit and a very welcome re-issue. 3. Panda Models are showing boxart pictures of the two forthcoming 1:35 UH-1D kits in their '1:35 Heliborne Series'. The fact that they have a '1:35 Heliborne Series' at all bodes well for the future, which hopefully still includes the rumoured Chinooks. 4. 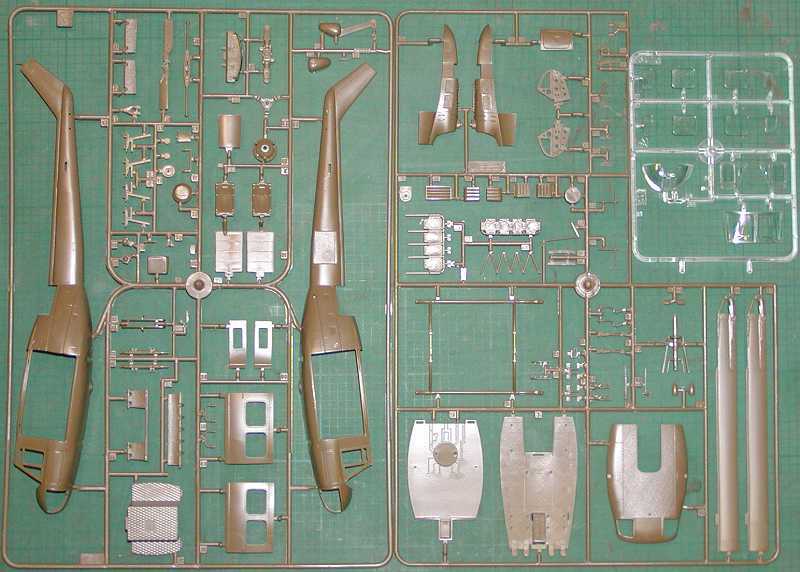 Hobbycraft are bringing out a 1:72 AH-64 Apache, #2204, origins unknown, but unlikely to be a new mould. 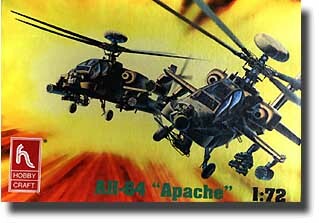 The product is listed as 'AH-64 Apache Anti-Terrorist', and comes in a box showing two Longbows. 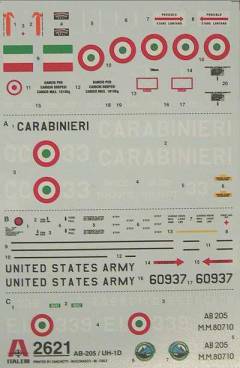 Decal options are said to include: US Army 2002, US Army Bosnia 1997, and IDF/AF 2001. So that's all of them re-issued between Jan-01 and the present. 7. Trumpeter's #5101 1:35 Mi-4A Hound-A is due to appear anytime soon. 8. Model-Aire International have reboxed the Sharkit Avro Canada VZ-9 AV Avrocar with new instructions and a solid box. The kit is cast resin with vacuform canopies and includes decals. 9. Hasegawa will be issuing a fourth version of their 1:48 Apache, this time it's #09452, an AH-64D Longbow in JGSDF configuration. The JGSDF selected the AH-64D In August 2001, with a requirement for 60 aircraft. 10. Lincoln County Line, makers of miniature figures, are offering a new resin figure of a 'Soviet Helicopter Pilot (Modern)' in 1:35, #LC0011. 11. 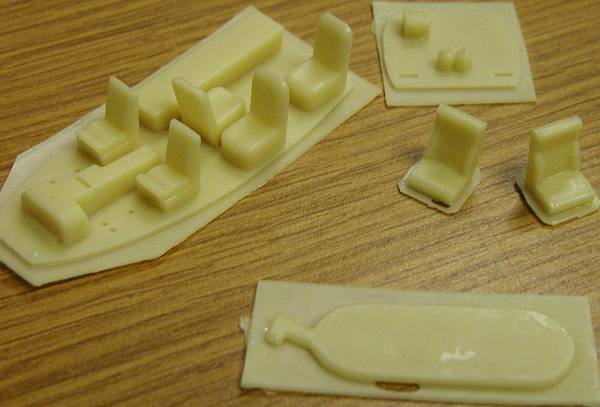 Whiskey Jack Productions are making a set of resin floats for the 1/72nd Italeri Bell-47. They report that the masters are done, they just have to finish making the mould. 12. To complement their recent Apache engine set, Czech Master Kits have now released #7059, a 1:72 'interior' set also for the Academy kit. This consists of a detailed resin and photo etched cockpit for both crew members, plus several detailed side boxes with covers, plus antennae and a detailed gun mount. 13. A first look at some of the recent Whirlybits resin conversion and detail products indicates fairly simple but well moulded products that would probably form a good basis for additional detailing. The Dauphin interior #WBA72001 has two pieces, the first is the floor with five seats (some of whose origins can be found in other kits), a base for the kit instrument panel, and a long box upon which a stretcher would lie; the second is a rear bulkhead with a monitor screen and the ends of two oxygen bottles. The instructions include comprehensive painting notes and info on seat belts, stretcher straps, etc. 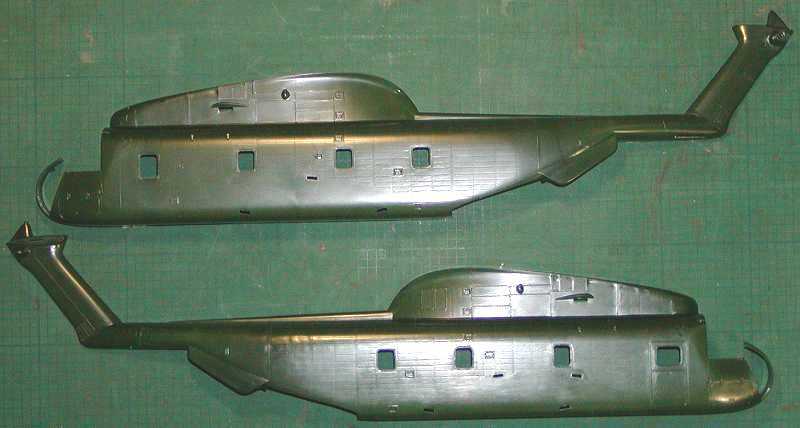 The H-19 blanking plate #WBA72005 is a simple flat piece designed to fill the gap after you've removed the non-standard bulge moulded onto the underside of the fuselage of the Italeri (& Revell) kit. The instructions imply that you're going to need some plasticard and filler as well. #WBA72003 provides two pilot seats "appropriate for use in all models from UH-1H / AB205 onwards, including the AB412". These are said to be of a more modern design than the armoured seats supplied in most Huey kits. Again the instructions include painting and seatbelt information, though the belts themselves are not supplied. 15. Wayne Mutza is working on a Huey Gunships walk-around book for Squadron/Signal. Thanks to Tony Morgan, Wayne Mutza, Colin Ritchie, and Gordon Parker (Whiskey Jack).